The helm depicted in this drawing hangs by the grave of King Henry VI in the South Quire Aisle of St George’s Chapel. In this plan, drawn up by Her Majesty’s Office of Works, Westminster, in November 1937, it is described as the “Henry VI helm”. In April 1937 this helm was in an auction at Sotheby’s. It had previously been in the private collection of Lord Zouche at Parham and was being sold on as the Funeral Helm of Henry VI, King of England. No doubt intrigued by its supposed association with one of the monarchs buried in the Chapel, the helm was bought by the College of St George. Shortly afterwards, these drawings of the helm were made by the Office of Works and are now held in the Archives of St George’s Chapel [SGC P.27-29]. The design of the helm can be seen much more clearly in the drawings than is now possible on the helmet itself as the paint has darkened with age. It is clear that the coat of arms displayed on the front of the helm is the St George cross on the left and the Royal Arms on the right. However, this is a Royal Arms which includes quarters containing the harp of Ireland (first included in the Royal Arms, along with the lion rampant of Scotland, when James I acceded the throne in 1603) and the arms of the House of Hanover (incorporated into the Royal Arms of this country only after George, Elector of Hanover, became King of the United Kingdom in 1714). This makes it quite clear that, whatever the age of the helm itself, the elaborate decoration on it post-dates the life and death of King Henry VI by well over two hundred years. This gives rise to many questions: when was the helm decorated? For whom and why? The Royal Arms depicted was used by George I, George II and George III, from 1714 until 1801, during which time both George I and George II and all of their children died (George III was the grandson of George II). But as none of them are buried at Windsor it seems unlikely to be a funeral helm, as originally suggested, for any of them. 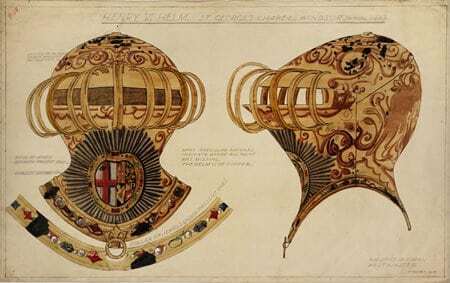 An alternative hypothesis put forward by Simon Metcalf, Armourer for the Royal Collection, is that it was in fact a Garter helm, designed for bearing the crest of a Garter Knight above the stalls in the Quire of St George’s Chapel. The helms that serve that purpose, though less finely decorated, are similar in shape to this one; furthermore, the drawing shows a socket fitted to the top of the helm which could have allowed a crest to be attached. If this were the case then perhaps it was a Garter helm designed especially for a member of the house of Hanover. But why was the helm ever thought to be connected with Henry VI? The decoration it bears now is clearly much later, but the annotations on the Office of Works’ drawing do suggest that there was some earlier decoration, as some pearls and jewels from this show through the paint. It is possible that the coat of arms was added later to a helm from a much earlier date. There is no documentary evidence to support a connection between the helm and King Henry VI. 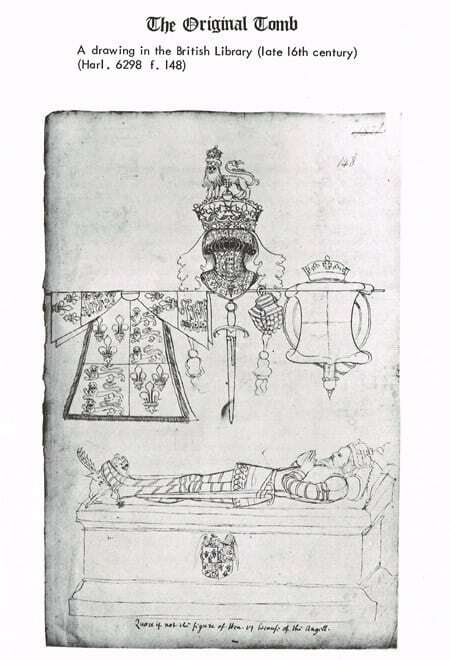 However, it has previously been suggested that after he was first buried here, Henry’s tomb was decorated with his heraldic achievements. The sketch below shows a proposed design for this. There are strong similarities between the helm depicted here and the helm now hanging in St George’s Chapel. Unfortunately, we have no way of knowing what Henry VI’s burial place would really have looked like in the fifteenth and sixteenth centuries. After he was interred here in 1484, the former king’s grave became a site of pilgrimage and there were many miracles reported to have taken place there when people invoked his name or touched his relics. After the reformation, however, practices such as pilgrimage and invoking miracles became frowned upon. Henry VI’s tomb ceased to be a shrine, the relics were sold or destroyed and the grave remained unmarked until the end of the eighteenth century, when King George III commanded that a marble ledger stone should be laid to mark the place of burial.